The Run Director for today's event was Paul COTTERILL. It was a nice 13ºC/60ºF morning with scant 5mph WNW winds when a record attendance of 163 runners [+1.6% (on event #62's PB)] arrived to burn up some energy on our awesome Edge Hill course. We hope you enjoyed your first ever 5k parkrun, and that you'll come back to us to do it all again for your second one! We hope you also enjoyed something a little bit different to what you're currently used to back home, and we look forward to seeing you again sometime in the near future. If you're wanting to up your pace in this game why not run along to one of our local clubs and sign on the dotted line - we're sure you'll receive a big welcome! Darren MCMAHON - Boo, must've been a timer fault with this one! Many congratulations if you were one of those in the list above . Unofficial pacer running in today's event was Joanne FAIRHURST. She just loves to do the 31min spot as she's training for a marathon in another country, therefore using us to pace herself into the bargain. If you* managed to use her to get you to push that little bit harder than usual in order to gain a new PB then well done. If you ended up seeing her gradually disappear into the distance don't worry, there'll always be another day when she'll do it all over again! If you would like to pace at our next special pacing day, which will be on June 20th, please see the volunteer section below. *A possible three PBs from our scrutiny of the results. Overall well done to all runners and volunteers who took part today, it's you that makes our parkrun that special Saturday morning phenomenon, and we hope you had a really great time here at Ormskirk! Peter GASKELL (SM20-24) of Liverpool Pembroke & Sefton Harriers & AC, was first over the line in 18:03 - first time in 3 appearances. Colin WESTHEAD (SM30-34) (Unattached) was second (third overall) over the line in 18:53 - was first to finish once before. Sam HOLDEN (SM25-29) (Unattached) was third (4th overall) over the line in 19:01. Of the ladies Tessa WALKER (VW35-39) of Salford Harriers and AC, was first (second overall) over the line in 18:14 - 5th time in 6 appearances. Debbie CAMPBELL (SW30-34) of Horwich RMI Harriers, was second (14th overall) over the line in 20:41 - was first to finish once before. Louise DERMOTT (VW45-49) (Unattached) was third (19th overall) over the line in 22:51. Today's full results can be found here. Jean MITCHELL (VW65-69) was graded 85.26% for the time 24:53 (43rd overall). Tessa WALKER (VW35-39) was graded 81.99% for the time 18:14 (second overall). Tony JACKSON (VM55-59) was graded 81.36% for the time 19:03 (5th overall). The latest Age Grade League (as at the last known event) can be found here. Thomas HOGAN became a new member of the parkrun 10 Club following this event. Well done Thomas! If you'd like to volunteer at any of our next six parkrun events please let us know as soon as possible by contacting our awesome Volunteer Co-ordinator who will fit you in on the roster! The majority of roles are very easy to do so please don't worry, you won't be thrown in at the deep end . We congratulate Kieran GREGORY on completing his DoE volunteering with us today. There are now no other DoE candidates registered with us. If you'd like to volunteer your time as part of your Bronze/Silver/Gold award requirements please contact us via our office address - see the Connect With Us section below. Please remember to bring your personal barcode with you to every parkrun event - if you do not you will not get your finishing time recorded. Laminate them if possible to protect them from rain, better still why not purchase a more durable barcode by visiting ERS, the authorised suppliers of parkrun UK barcodes. parkrun insurance stipulates ALL juniors listed in the JM10 or JW10 categories (i.e. all children 10 or under) MUST run with a PARENT or GUARDIAN at all times around the course. Failure to do so may result in the child's time being removed. Note - if there'll be no nearby matching surname in the results it's imperative you let the scanning team know on the day, or contact us as soon as possible later, to avoid this happening. Please do not take the finish tokens home with you as we need them again for the next event. If you do find one in the washing later even if the event was a while ago, please let our office know. We'll be pleased to have it back again to join its friends. Thanks. 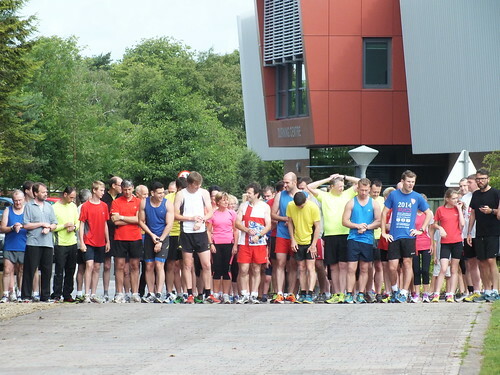 Ormskirk parkrun started on 29th March 2014, and since then 1,463 different runners, including participants from 129 athletics clubs, have completed 6,119 runs covering a total distance of 30,595 km, and there have been 1,629 new Personal Bests. The female record is held by Olympian Jennifer MEADOWS who ran in a time of 00:17:23 on 2014-11-15 (event number 34). The male record is held by Stuart ROBINSON who ran in a time of 00:15:43 on 2014-11-29 (event number 36). The Age Grade course record is held by Jean MITCHELL who recorded a 87.49% run (24:15) on 14th March 2015 (event number 53). Our special pacing days take place on the third Saturday of each month, the next one being on June 20th. The Event Directors of Ormskirk parkrun are Paul COTTERILL and Robbie KIGER. The Run Directors are Peter DOLAN, Eleanor FIRTH, Steve HALL, Anna HULME and Steve KYRIACOU. Other Core-Team members are Jeanne HALL, Jan MULLIN, Joseph MULLIN and Karen HULME. Reach us at our office via e-mail for one on one private communications. We are always grateful to receive donations and these will go towards the replacement of equipment, the purchase of medals/certificates for our anniversary awards and for other essential gear which will make our parkrun run go safely and smoothly. If you would like to donate please see this page, however before doing so please make sure your home run is set to Ormskirk in your parkrun profile as this is what will be used to link your donation to us. We thank you for your gift. Looking forward to seeing you all again with your barcodes at our next event! This entry was posted in Run Reports by ormskirkoffice. Bookmark the permalink.